You can prevent theft and vandalism by installing in plain view a realistic looking security camera. This model is a speed dome since the real version has a rotating camera with 360 degree view. Make the bad guys think you have them in sight so they cannot hide. they will most likely leave you alone. 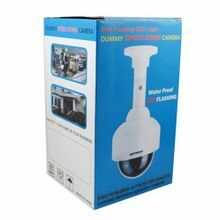 This Dummy Speed Dome Camera also has a flashing led light to add to its realism and make its presentation more effective. Dimensions approximately 6 inches by 9 inches. Uses 2 AA batteries (not included, but orderable, see dropdown menu).